Podcasts aren’t going anywhere. That seems to be an indisputable fact these days. There are more than 660,000 podcasts available today, with over half of the U.S. population stating that they listen to podcasts regularly and relatively frequently. And with those numbers, technology followed. The number of smart speaker owners grew about 78 percent just from 2016 to 2017. These were the numbers that Debbie Hiott, general manager of Austin’s NPR station KUT, used to give a clear picture of the stakes involved when talking about the future of audio content. Hiott chaired the panel “Ok, Google, Alexa and Siri: Play the news. 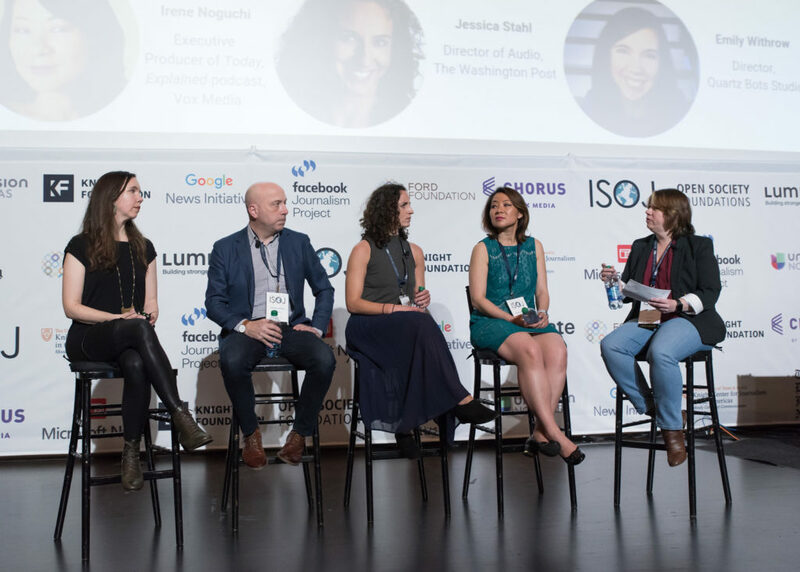 Can you really help journalism in the podcast boom?” at the International Symposium on Online Journalism (ISOJ) on April 12. That’s why ISOJ assembled the people behind some of the most prominent podcast productions today for this panel about the future of podcast journalism right on the verge of the voice assistant revolution of Siri, Google and Alexa. She summarized their approached intro three main ideas. First, a podcast needs to craft a unique sound, making all subject matters light and accessible to listeners. Second, it needs to tap into listeners’ curiosity, using topics they are already curious about and explain them well. Third, producers need to experiment, even though it can be challenging. Noguchi suggested sound design and creative production ideas to keep listeners engaged even through boring subject matters. Eventually he came around, acknowledging they had garnered over 18 million downloads using that approach. Lickteig now uses the resources NBC has to create a strategy for audio-first content. That includes leaning heavily on the NBC newsroom for its talent as well as hiring new people that focus on podcasts only. Together they re-work content, re-imagine visuals for audio and make use of the archives while also developing new formats. Meanwhile over at The New York Times R&D group, Lead Kourtney Bitterly and her team have been trying to figure out how the advance of smart speakers will figure into the future of podcasts. “In the newsrooms we’re used to creating content but with smart speakers we have to create user experiences as well,” she said. Bitterly talked about trying to understand the potential of smart speakers beyond the basic uses they serve today. An interesting insight they garnered during this research was that people are trying to create boundaries for their technologies. The potential mental health risks of smartphone use, already being covered today, could mean a big chance for audio content. While many users suffer from news fatigue, “Audio doesn’t seem to have the same constraints as other news. It just feels like smart people having a smart conversation,” Bitterly explained. But that in no way means that podcast producers have already figured out the perfect method. There is still a lot of room to experiment. She advises those in the audio sphere to adjust formats to people’s lives and design for shared consumption — for instance, parents listening with kids. Emily Withrow, director of the Quartz Bot Studio, approaches smart speakers from an interactive perspective. They want to design narrative experiences for chat and audio, basically creating a story you can talk to. “Imagine you could have an intelligent conversation with the people reporting the news. I’ve been fascinated by that idea,” she said. One of the main concerns in developing this kind of interactive audio is actually figuring out who the story is interacting with. “Great conversation design figures out who you are and speaks to you,” read one of her presentation slides. This could also open up possibilities to “check in” with listeners, for example while baking bread. The smart speaker could inquire whether the yeast is taking effect by asking “Do you see bubbles?” If not, the listener will hear how to adjust the recipe. Focus on the individual users (within reason) and figure out different approaches for them. Let go of the idea that there is one perfect way to tell a story. Figure out how to guide different users through the experience by gaming it out. To those willing to “embrace the chaos,” Withdraw provided a free template to try and create an interactive audio experience, playboard-template.glitch.me. A fairly new addition to the list of legacy media outlets joining the podcasting scene is The Washington Post. Jessica Stahl is the director of audio and has helped to grow the audio platform to its current stable of 14 original podcasts. “Smart speakers are going to be on every device that we own,” said Stahl, which is why The Post is willing to invest in audio, including the technology and development behind podcasts. Trying to figure out what would make its podcasts unique, The Post decided it would focus its journalism and depth of coverage not just on politics. But that decision alone doesn’t lead to success in audio. “The way that I think about it is that there is room for more things in the audio space. Especially for journalism. But not room for everything. There’s room for great things,” Stahl said during her presentation.